Join us for a free family-style supper at 6:00pm followed by stories for children of all ages at 6:30! Families with children of all ages are welcome. Space is limited to 40 people; registration is required and begins on 4/15. This month, we will serve supper from TBD. **Please be sure to register by Monday at 2:30pm so that we know how much food we will need! ** This program is sponsored by the Kiwanis Club of Lapeer. 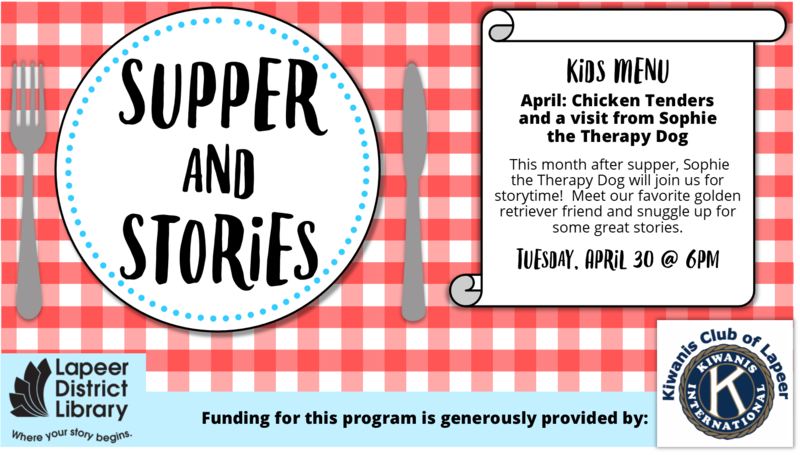 Supper & Stories will have a different theme each month. This month: A visit from Sophie the Therapy Dog! Choose a book to read with Sophie or visit with her during our story session.